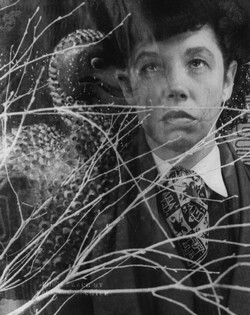 Harriet’s song contains a text thematising a childish mode of sisterhood, by American writer Jane Bowles, from her puppet play A quarreling pair. The viola player sings the text, towards the end of the work. The percussion part includes strung-up objects (keys, feathers, a music-box, a bag of milk ...) which are cut down during the course of the piece, falling to the ground. "Theatrical 'Harriet's song', which is edgy and whimsical by turns"
"A witty and moving piece"
"(Phoebe) Green was joined on stage by percussionist Leah Scholes for the (Australian) première of Juliana Hodkinson’s touching and humorous Harriet’s Song. The piece seems to be a musico-theatrical meditation on familial relationships. Scholes and Green play ethereal, almost inaudible tones on vibraphone and viola. Then suddenly, Scholes darts out a pair of scissors at one of the many objects dangling by fishing wire from a microphone stand. A bell clashes to the ground, or a feather lightly floats away. At one point Scholes sharpens a knife and cuts three objects off at once. One’s eye lingers expectantly on the small glass hanging precariously from the fishing wire. The process could continue until all of the objects have shattered on the ground, but Green saves us from this antagonistic fate. Green detaches a music box from the stand and starts humming along to its tune. The piece concludes with Scholes gently accompanying the lullaby on the vibraphone and the rest of the hanging objects."